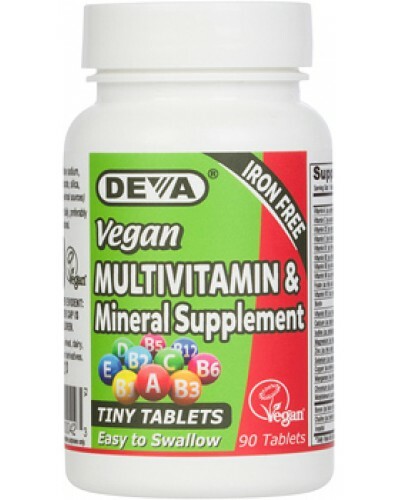 Deva Vegan Tiny Tablets Multivitamin (Iron-Free) provides varying amounts of vitamins and minerals while keeping the size of the pill small enough to swallow with ease. Those who usually avoid taking nutritional supplements that provide more than 100% DVs or that are difficult to swallow will welcome the ease with which Deva Tiny Tablets can become part of a daily health routine. Deva Vegan Tiny Tablets Multivitamin without Iron is extremely affordable and certified by the Vegan Society, the non-profit group that invented the word “vegan”. DEVA Vegan Tiny Tablets Multivitamin & Mineral (Iron-Free) is 100% animal free, registered by the Vegan Society, and guaranteed for purity, freshness and labeled potency. For adults, take one (1) tablet daily with food, or as directed by your health care provider. Free of yeast, wheat, gluten, sugar, salt, dairy, egg, shellfish; animal products, byproducts or derivatives.